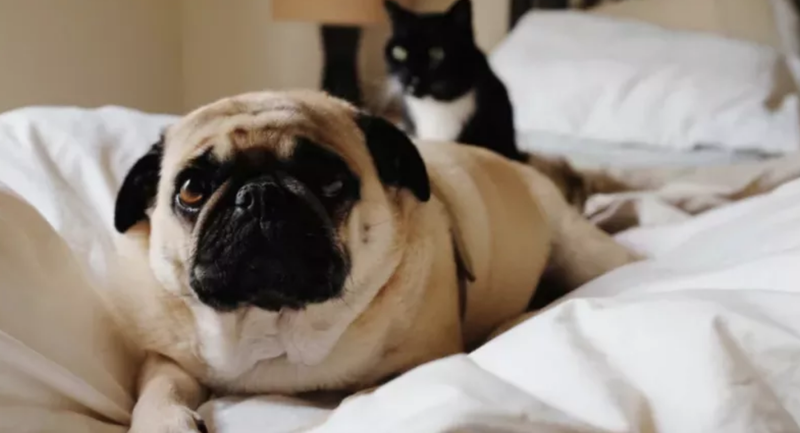 In bedfellow news, a recent study by researchers at Canisius College suggests that some women sleep better next to dogs than they do next to members of their own species. According to the New York Post, researchers interviewed 962 women living in the United States. Of this sample, 55 percent reported sharing their bed with at least one dog, 31 percent with at least a cat, and 57 percent with a person. A previous study conducted by the Mayo Clinic in Arizona found that all people who slept with a dog generally got better sleep. Kind of strange to replicate this experiment but just with women and, what the heck, also with cats. According to SFGate, the study recommends further research on the matter, “to determine if pet owners’ perceptions of pets’ impacts on their sleep align with objective measures of sleep quality.” Whereas I would like a follow-up study to investigate whether the real issue here is that people aren’t being kept up worrying about farting next to their dogs or because their dogs are farting. If this theory panned out I would then commission another study on why people are afraid to fart in front of their cats. It would be very expensive.